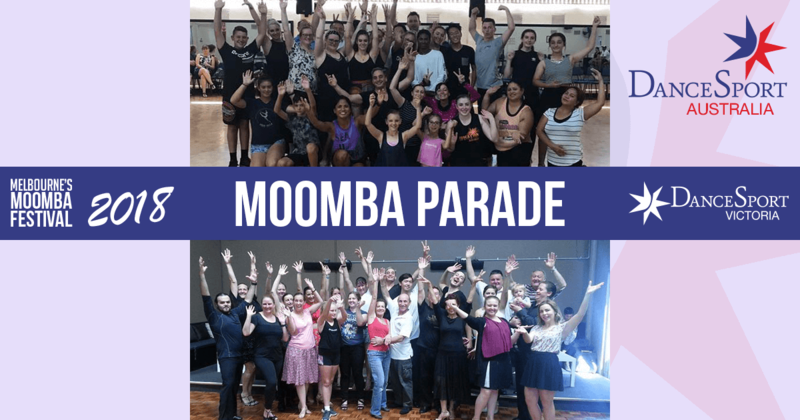 DanceSport has a team of 50 dancers training for 2018 Moomba Parade! When DanceSport Victoria called out for volunteers to dance in the Moomba Parade 2018 the response was overwhelming, with more than 100 people registering their interest. This is an awesome result and shows how much support is out there! The team size had to be capped to 50 in order to ensure dancers at the rear of the formation would be able to hear the music being played by the band marching in front of the team. Even so, this year's team is nearly triple the size of that which danced in 2016. The dancers selected to form the 2018 team are now busily training and very excited to be performing on Labour Day for the people of Melbourne. The team is so large we have had to split it into two training groups, one in the north-west of Melbourne and the other in the south-east. Having two distinct locations ensures the dancers, who come from locations all over Victoria, are able to attend the training sessions. The north-west team trains on Saturdays and the south-east team practices on Sundays. Having the teams train on different days enables the dancers to attend when it best suits them or, if they wish, they can participate in extra practice sessions. No matter where they come from, all have jumped at the chance to dance in Moomba. The Melba College Band from Croydon have kindly agreed to play for us. They are a veteran marching band that performs in the Anzac Day parade every year. Vivian Doolan, Melba College Music Director, is overjoyed that she and her team of 24 kids will be leading the DanceSport contingent along the route. The dance team includes a number of people from other dance disciplines such as Jazz Ballet and Dance Fitness. This is a wonderful result and shows how DanceSport can help unite dance groups to promote dance. Martyn Kibel, Chairman of DanceSport Victoria, commented how great it is to see various dance groups come together and perform in such a united fashion. Geoff Vine, Chairman of DanceSport Australia’s Marketing and Communication Commission, stated at a recent training session of the south-east team, "It’s great to see how well the dance team is picking up the routines. After only a couple of sessions, they’re already looking very good. I can see they’re going to be quite a showpiece on the day of the parade." The dance team is diverse in various aspects. It includes a broad range of skill levels, from beginners right through to professional, and is made up of all ages, from children through to seniors. This clearly shows that dancing is for everyone. Geoff Vine added, "We are thrilled to showcase dancing and show what DanceSport can do for Victoria. We intend to make sure the parade dance will be fun for the team and entertaining for the public." We are very grateful to Geoff for all the hard work he has done in getting the dance team together for the Moomba Parade. Moomba was so impressed with what DanceSport had organised for the parade, that they had one of our couples do a special performance at the crowning of the Moomba King and Queen. Sam Brown and Berkley Wood, Australian DanceSport Junior Champions, performed for Jimmy Giggle and Chrissie Swan when they were named as the new King and Queen of Moomba on Monday 12 February at Melbourne’s Botanic Gardens. Read on for more.